Past and present publishing projects. In fact in 2016 on a trip to Colorado I reconnected with the ministry of Messenger International. A recurring story concept had been going through my head and I came to realize how nicely it would dovetail into the lore and concepts John had already established in Affabel. Excited, I contacted them and they showed interest in the idea of my story woven into the world of Endel and Affabel. Thus the graphic novel series "From Endel to Affabel" was born. I can say without reservation that this has been my most inspired and absolute favorite project I have had the honor to write and illustrate. Here are but a few of the graphics from the series. Solomon said that there is nothing new under the sun. So it is. Yet every soul has something unique, that one thing that is our very own. We all have our story. In our story, will we touch the world? Or consume it? Will we stand, surrendered, covered by an accepted promise or fall, naked, armored in our self-will? Will we accept Grace or demand justice? The stories chronicled in this 12 issue series, "From Endel to Affabel", are true testimonies of those who have gone before. And be Solomon's words true, then indeed we can each identify a piece of our story within one of these twelve, and thus have the advantage of their experience. No matter our life’s circumstances, we choose. Oh, but let it be an informed choice. Be not deceived: our King, full of love, yes, abounding in grace, yes, but our King is not mocked. From wherever you sow, it is from there you shall reap; what you plant, you will harvest. “Sow well,” as Charity advised. Two lands, one decision. Choose wisely. From Endel to Affabel is a twelve issue graphic novel series told through the lives of its allegorical characters. Their choices and actions in Endel effect their lives in Affabel, even their very citizenship. Their lives are told honestly in Endel, and the truth of their choices are revealed in Affabel. Scripture references are scattered throughout the series. An ongoing murder investigation, political intrigue, spiritual warfare, as well as the everyday lives of people struggling with addiction, abuse, mental illness, stress and loss, propel the overall story to a climatic conclusion of perfect love and unconditional forgiveness. Through the series, some will find love, others loss; some unmerited kindness, others unexpected relief; some will battle Dagon himself, and some will fall, fist raised defiantly, to King Jalyn. Yet, each will have their own story and ultimately be accountable for their choices. But in the end, truth will reign and grace will be granted. Each one will have the opportunity to accept the gift of salvation. Will they choose wisely? We all react to the books we read, but what if the book we read is filled with OCD unicorns, ill-tempered minotaurs, befuddled leprechauns and aquaphobic mermaids reacting to how their book is read? A young boy snuggles up with a story about mythical creatures while enjoying a slice of crumb cake and a glass of milk. Oops! He is a bit messy and the Unicorn is irritated by the crumbs dropped on her page. The Dragon on the next page loses his fire when the milk is splashed about by the careless reader. Very foolish... As the story progresses, some form of neglect befalls each page--a sloppy spill, or a reckless rip, or an unwarranted crayon doodle--and the illustrated creature that lives on that page reacts. When you get to the end, the reader finds out what such a feisty book does when it is treated poorly or, hopefully, with respect. …And a Book can be a quick, lyrical read. However, the rich, layered illustrations and the dynamic personalities of the book’s inhabitants will draw the child into exploring this world of mythology over and again. When nothing is more of a something than anything. If you ask the young man in this book what he did during his day....He will tell you "nothing". Take a look and see if you can keep up with his "nothing". So it begins! "Nothing" is the exact point where a child's imagination and an adult's pragmatism meet. For the child this story is familiar fare, yet no less adventurous and exciting. 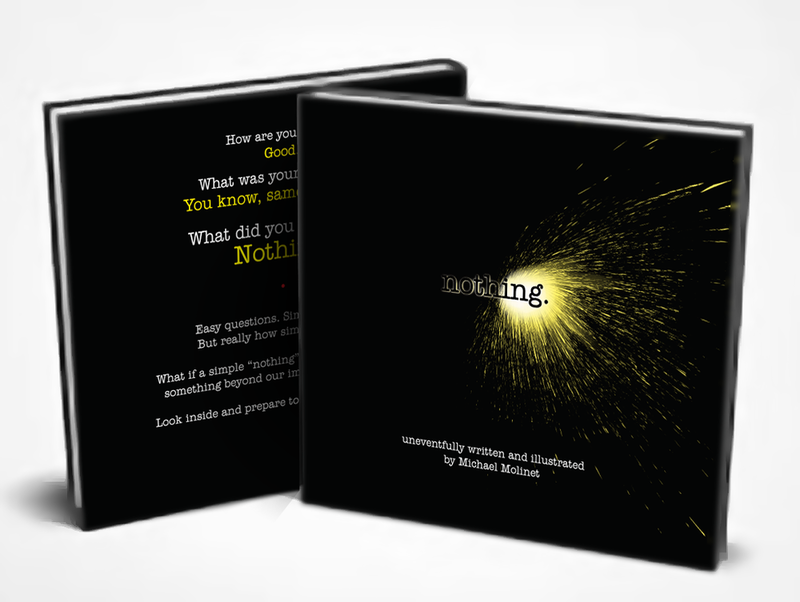 For the adult reading it, this adventure is a reminder how precious "nothing" is! Parting is such sweet sorrow... Unless you really drag it out. Who wants to go home when you are having so much fun? Well that is the exact dilemma these two friends are in. How many different ways can they say goodbye to delay the eventual departure? Let's see. And so it goes... This is an old project, but so fun to read to my children even today. It was written from my experience of saying my morning goodbye to my oldest children when they were little. We would all drag it out till I was late for work. My son Jesse was especially clever at it. He lost his life in a drowning accident in the summer of 2005 when he was eight. That is one goodbye I wished would have lasted longer. Many of these clever quips are to his credit. "Mom? Dad? Where was I when...?" A charming from the heart story richly illustrated, plainly voiced. A simple way to affirm the truth that all children are known and loved by God even before they are welcomed into the world. Can also be used as an introduction by parents to tell their own unique story of how they became a family. 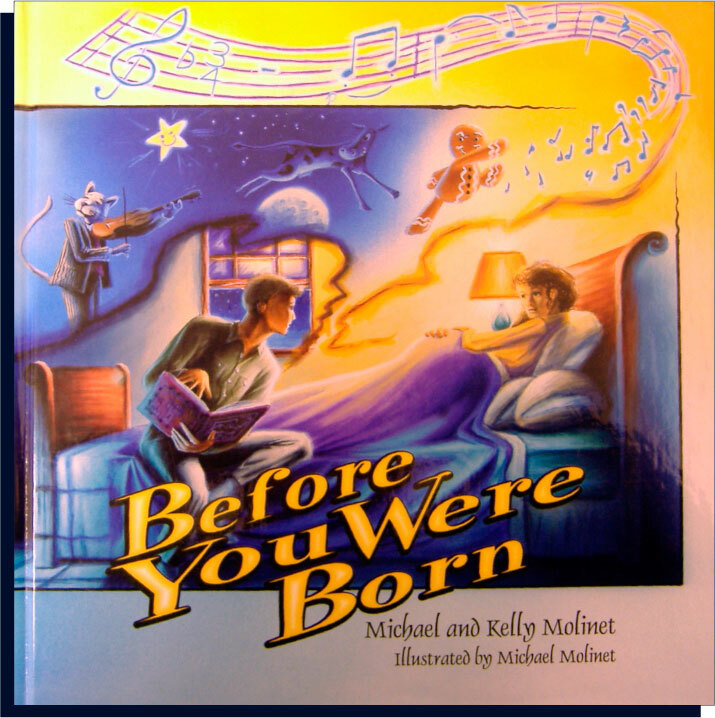 Picking up where "Before You Were Born" left off, "Just Like You" helps parents to prepare their child for a new addition to the family. It's a fun and exciting way to involve big brothers and sisters in the excitment through vivd illustrations that convey just how the coming baby is a unique gift from God... just like them!